Forty years in the making, FAACV has been dedicated to unity, charity, service and patriotism. June 16, 2012 - Providence Forge, VA -- FAACV hosted its third annual Charity Golf Event. Held at the Golf Club of Brickshire, a portion of proceeds over the past three years have benefitted the Children's Hospital Foundation (which aims aims to improve the quality of life of the children in our region with improved medical and therapeutic services and supports the programs and initiatives of the Children’s Hospital of Richmond), The Daily Planet (an organization that ad-dresses the health needs and homelessness problems of our area), and CARITAS (Congregations Around Richmond Involved in Temporary Assistance and Shelter, another organization that provides assistance to the homeless). July 25, 2012 - Chesterfield, VA -- Philippines Little League Baseball Team "Barakos" came to Virginia to compete in the 2012 Pony11 International World Series. 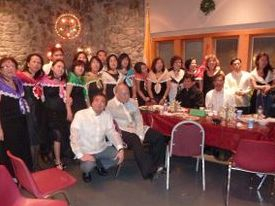 As the local Filipino American organization, FAACV volunteered countless hours to assist these young competitors by providing room & board and transportation to and from practices and games. “In behalf of the Philippine Team who participated at the PONY International 2012 Bronco-11 World Series in Chesterfield Virginia, we would like to express our sincerest gratitude for giving us the most memorable 10 days of our lives," said Rodolfo Tingzon, Delegation Head of the Barakos and President of the Philippine Tot Baseball Foundation. January 2014 - CARITAS shelter - FAACV volunteers to work food service at local CARITAS shelter. 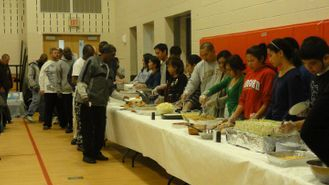 While community-service focused, no organization can be all work and no play. 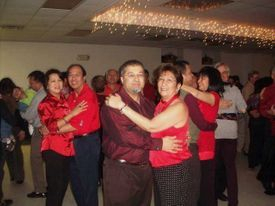 FAACV sponsors events year-round for its members to socialize and "let their hair down," such as the annual Philippines Independence Day picnic, New Year's Eve party, Valentine's Day dance, Simbang Gabi, and Filipiniana Night.